“Are You nuts?“ ; “Oh …that’s awesome!“ The other common reaction was a blank stare as they processed what they could possibly say that would be polite. It was interesting to witness the reaction when people discovered my plans to cage dive with Great White Sharks in a remote Pacific feeding ground…and that I was also bringing my 14 year old son to share the experience. This mixed reaction is completely understandable given all the information, misinformation and rampant misrepresentation of White Sharks which culminates in a Sharknado of activity during Shark Week. (Aug 10-17). I can think of no better way to celebrate Shark Week than board a boat in San Diego, commence a 5 day adventure at sea to get in the water with these majestic animals and witness first-hand their magnificence. The ultimate selfie. My son Sam being photobombed by a great white shark. They always look like they are smiling. 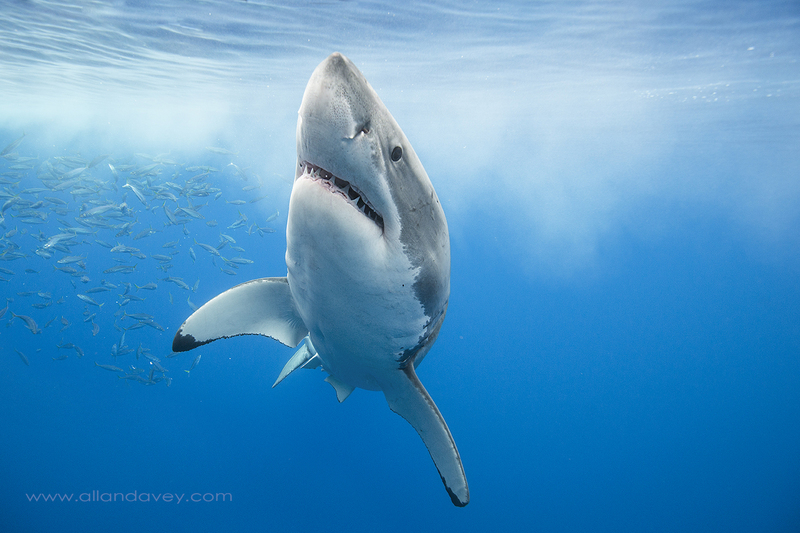 This is a photography blog so I will get to how this all relates to photography but first let’s start with some of the misconceptions about white sharks. There are no specialists with a comprehensive understanding of white sharks. Our knowledge of white sharks is very limited and the community that has experience with them first-hand is relatively small. Sharks are not our enemy. We are not shark food. 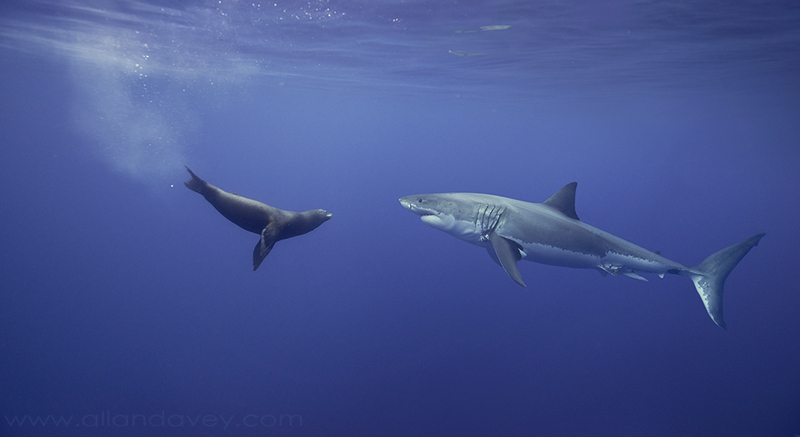 White sharks eat seals and fish and do not seek us out as a food source. 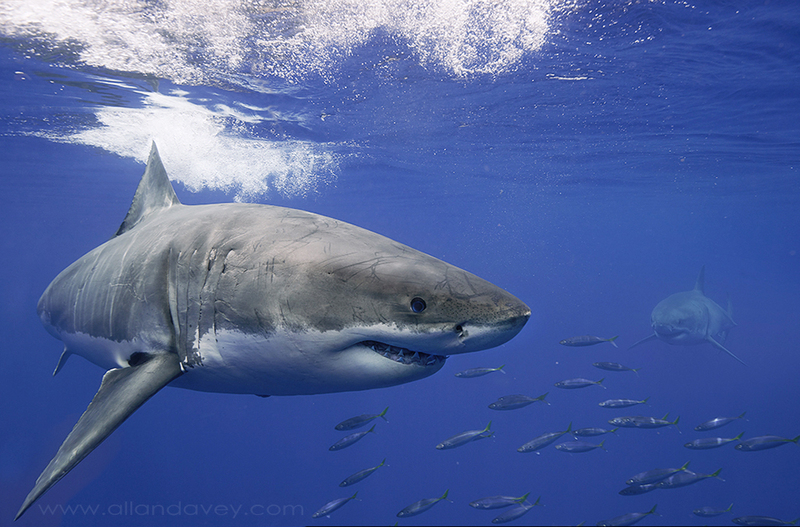 Most white shark attacks are either a case of misidentification in limited visibility or induced by human stupidity. The victim often succumbs to excessive bleeding, not being consumed. Sharks are not our best friends. Sharks are predators that deserve our respect. They are intelligent curious creatures but they are also not looking out for our best interest. White sharks are one of the sharks that lack the necessary muscles to pump water through their mouths, therefore they have to keep moving. No one has witnessed the equivalent of sleeping in white sharks. Regardless they wouldn’t lose any sleep if they injured or killed you. Similar to ”man’s best friend“, dogs don’t consider us food but I wouldn’t jump into a group of feeding pit bulls without taking some serious precautions. Significantly more people die from dog attacks then shark attacks. When you watch videos of divers swimming along with White Sharks they are relying on the fact that we are not their food but they are not really respecting the nature of this wild animal. It is important to dive with an experienced knowledgeable company. My choice was www.sharkdiver.com and I highly recommend them. When we want to check out something we pick it up with our hands, sharks however use their mouths to explore. This is why it was important to constantly be aware of our surroundings when we had hands, feet and our heads sticking out of the cage. Sharks are completely silent when approaching so it is crucial to be vigilant; It isn’t the shark you’re paying attention to you that have to worry about. 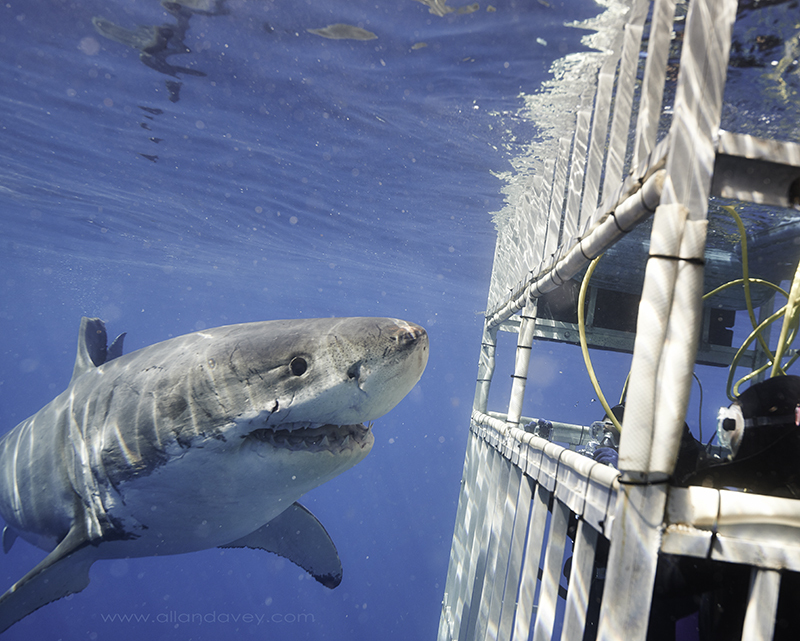 I always thought that the experience of diving with white sharks was only available to researchers and film crews. When I stumbled upon SharkDiver.com and discovered this was something that I could experience, there was only one thing I could say;“I’m In “! In addition to an amazing life experience this would also be an outstanding photographic opportunity, a great chance to add some unique images to my stock library and hopefully expand my knowledge of these misunderstood creatures. As a commercial photographer and digital artist I build specific images, often combining photographs from multiple sources to create an image that tells a story. When coupled with body copy and headlines, the image communicates between my client and their intended audience. I don’t always custom-shoot everything I need to create that image. I do however maintain a massive library of photographic elements that I can pull from to add unique details and ambiance that allows me to push things a little further than I could otherwise. My clients appreciate that this is something I include with my services without having to worry about additional rights management and extra costs. I am constantly adding images and updating this library. This allows me to take interesting trips each year and gives me an opportunity to learn and explore new photographic techniques. It also allows me to add to my skill-set as a photographer. This was one of those trips that required me to amend my skill-set by exploring the world of underwater photography. If you just want to continue reading about the shark adventure skip down to ( “San Diego” ) If you are interested in the details regarding underwater photography and equipment used on this adventure, read on. 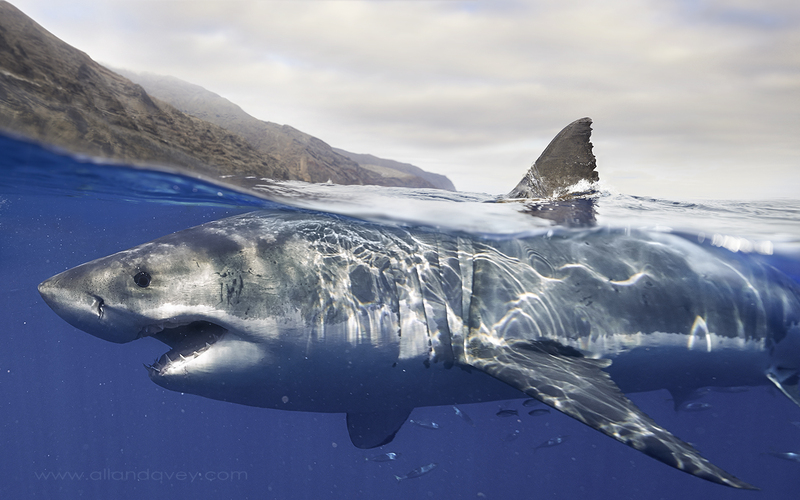 Guadalupe Island has crystal clear water and is considered the best location to view these magnificent creatures. I brought most of the usual gear on this trip (see list below). For underwater I had to make a choice of which camera I would purchase the underwater housing for. Housings were available for all three bodies I was bringing, but ultimately I decided on the Aquatica AD800 to house my Nikon D800. The Aquatica is a top-of-the-line housing machined from solid blocks of aluminum. It has extra ports for adding remote triggers and lighting and every function is available on my camera with incredibly designed buttons and levers. The build quality is apparent as soon as you pick it up. It has some weight to it but as soon as it is in the water it is almost neutrally buoyant and easy to handle. It felt great it my hands underwater. The housing has a built-in moisture alarm that has an audible warning and a flashing light if water gets inside. (which it didn’t). I plan on exploring everything I can do with this housing-not just typical underwater diving photography-but I plan on getting creative, exploring all I can do with a camera that’s protected from the elements. I wanted to capture some half-and-half images; this is when you see underwater and above at the same time. For that reason I chose the mega dome 9.25” glass dome. It is a large piece of glass and I wrapped it well in bubble wrap and some foam pads in my carry-on luggage. The body and dome come with a special cap that has a small hole in it. This allows for the pressure stabilization on flights. Apparently you can damage your seal if you have the unit completely together, and the pressure change is the opposite of what you experience under water. The large glass dome was also something I had to be very careful with; it would be easy to bang it into the metal bars of the cage we were diving in especially when quickly and unexpectedly retreating into the safety of the cage. Most of the time I hung the camera out through the open area of the cage, but I had to be quick to bring it back in on occasion (Those sharks are sneaky and completely silent). You have to keep it clean otherwise your autofocus will attempt to focus on the glass. You will also notice in bright light the front of the lens reflects in the glass. You will have to prepare to retouch that out in some cases. Equipment for this adventure… Nikon D800, Nikon D4, Nikon 16-35mm, Nikon 24-70, Zeiss 21mm, Nikon 300.2.8, Phase One DF645+ with IQ 260 60 mp digital back, Phase One 120 and 35mm lenses, Schneider Kreuznach 80mm, Aqautica AD800 underwater housing with 9.25 glass megadome, Swivelling extension pole with remote trigger, Ikelite DS161 Strobe/video light, Olympus Stylus Tough TG3, GoPro 3 black and GoPro 3+black (If you are wondering why I brought the medium format system it is because I photograph a lot of skies for my library. Having no obstructions in the fore-ground is a rare occurrence for me so being out on the ocean for five days allowed me to add a significant number of high resolution skies to my library. Testing the Aquatica AD800 with the swivel extension pole before the trip. As it turned out this extension wasn’t as practical on this trip as I had hoped for. I spent as little time out of the water as possible. When I was topside I was busy downloading cards and prepping for the next dive. However I do wish I had this with me when I was photographing gators in the Florida everglades last year. 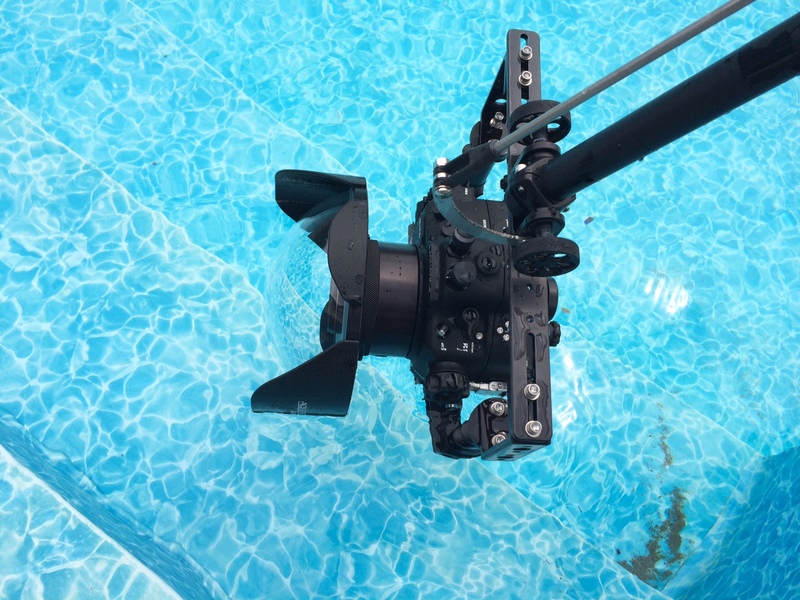 It is very heavy and awkward until the camera gets in the water where it is buoyant. It will get plenty of use in the future. 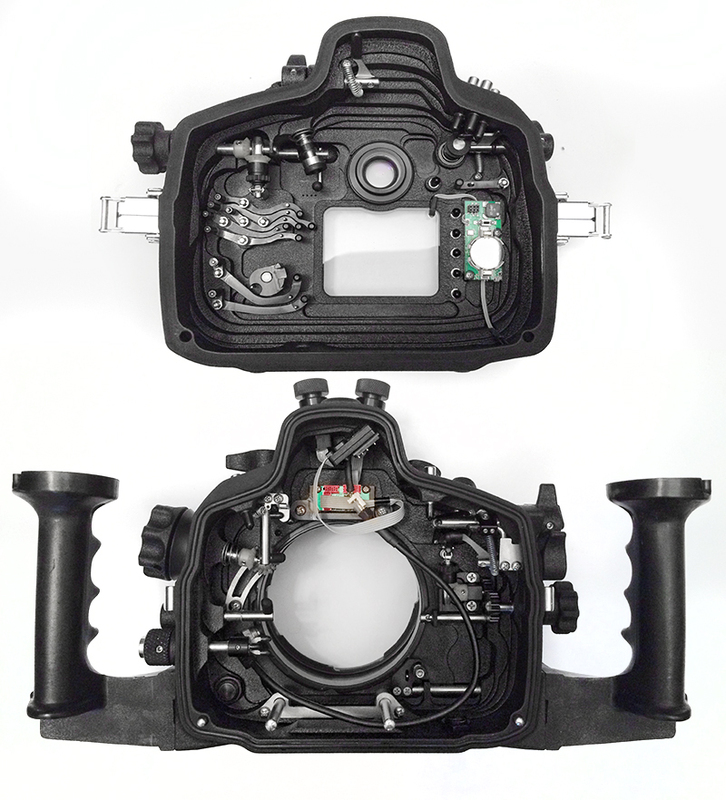 Inside the incredibly well-engineered Aquatica housing. This thing is a work of art. Since sharks are very large and would be in a range of distances that I decided I would go with the Nikon 16-35mm f4 lens. This lens is very sharp and I felt that it wasn’t likely that I was going to want to shoot at less the f4. I was happy with this choice in the end and being able to zoom was essential. I had to attach a zoom ring to the lens that can easily be removed or added with a few allen screws that held it in place. It is necessary to have a 63.5mm / 2.5” extension ring with port locking mechanism between the housing and glass dome to accommodate this lens. It was easy to zoom on the fly. It is also important the lens is on auto focus. In addition to the camera housing I also brought one video light / strobe with extension arm. I was thinking that I wanted to add just a bit of light in the mouth and underbelly. In the end the strobe was more cumbersome than one would want in a cage dive and risked casting shadows from the bars. The water at Guadalupe is very clear and I shot without using a flash. If I had more time I would have experimented more with it on the dives with overcast lighting. The other piece of equipment I brought was a remote trigger pole with tilt mechanism. I figured between dives I could spend time shooting the sharks from the boat. Turns out there isn’t a lot of time between dives. We did 1-1 1/2 hour shifts in the water with an hour in between. By the time I emerged from the cage, washed my camera equipment in fresh water, dried it, changed cards or batteries, downloaded cards and ate it was time to get back in the water again. I did spend some time experimenting with pole cameras but not as much as I thought I would. It is amazing to do all that while watching the sharks breach and swim around the boat. However I do wish I had the remote trigger tilting pole when I was photographing alligators in the Florida everglades last year. The other underwater cameras I brought in to the mix were two GoPro cameras (hero3+ and hero3 black editions) and an Olympus Stylus Tough TG3. If I wasn’t a pro photographer looking for that extra resolution and quality these would be all I would bring with me. You can easily reach out of the cage anywhere between the bars and the quality is as good as most people will ever need. Both can be rented on the boat and the Dive Master Martin Graff from Shark Diver is extremely helpful setting you up with whatever you need. I did get some of my favourite video footage topside with my GoPro when a white shark grabbed the rig that the camera was attached to and took off with it. (There is a link to this footage at the bottom of the post). I also found myself constantly pointing the camera at the business end of the shark, centering the eyes and jaws in the frame. This is something I don’t innately do as an experienced photographer but it is something that is important to consider. In an underwater camera with a zoom lens you have to put the camera on autofocus. A shark underwater in overcast lighting doesn’t give the autofocus a lot to work with. I found my self occasionally pointing for focus instead of composition occasionally. Offsetting the focus point is one way to deal with that but you never know which direction your subject is going to arrive from. The action can arrive unexpectedly from anywhere and be over before you know what happens. All this while protecting your gear from hitting the cage, trying to suspend yourself without sticking your leg out in an area you haven’t determined shark-free, and watching for sharks on your blind side. Spending a lot more time under water using the housing would be necessary to be faster at changing the focus point on the fly in an action-packed split second. Brad Perry from the KUSI station interviewing us for the Good Morning San Diego show the day we left. San Diego was where we embarked from. Since it was Shark Week the Good Morning San Diego show from KUSI featured us, the crew and a handful of people that had travelled previously on the trip, repeatedly cutting back to us for live interviews during the morning show. It was fun and gave us a chance to meet with some of the crew and divers before the trip. We set out that night at 9:30 pm on a boat called the “Horizon” with plans to make it to the port in Ensenada Mexico when customs opened at 8 am the next morning. The customs agents boarded the boat with a drug sniffing dog and worked with the crew of the Horizon to efficiently deal with all the necessary passport, permits and paperwork. We immediately set out due west into the Pacific with plans to arrive at Guadalupe Island just before sunrise the following morning. A 30+ hour journey to reach a small remote island is no small expedition. It was, however a thoroughly enjoyable experience. The chefs made outstanding meals and snacks including meals of prime rib and Cornish hens. No shortage of sea life was on hand to further enhance the experience. The captain maneuvered us closer (but not too close) to a number of the numerous whales that we viewed surfacing. Flying fish, sea turtles, giant Mullah, Sail Jellyfish were just some of the wildlife we experienced in transit. As soon as they noticed us, pods of dolphins would race from the distant horizon to play at our bow. Sleeping in a berth with my head near the hull listening to the waves slap against it reminded me of the fact I was out on an adventure. I love being out of my element and experiencing things that can only be experienced by taking yourself out of your comfort zone. I slept like a rock. Arriving in the early morning darkness and watching the massive cliffs of the island emerge from the darkness after so many hours of emptiness was the perfect powerful and ominous backdrop. It added to the excitement. It was interesting that I didn’t detect any nervousness from anyone. Everyone was itching to get in the water and start experiencing the white sharks first hand. The crew maneuvered the cages into the water while everyone ate breakfast and readied their camera and dive gear. The sharks arrived within minutes of us climbing into the water. Guadalupe Island is a biosphere and a portion of our fees go to pay for management of this protected area. There are a handful of people stationed at the island and it wasn’t long before they made their way out to the boat to say hi and check that we had our biosphere bracelets on. Our presence there helps protect the sharks from poachers and allows everyone participating in the dives to help add photos to the database. After each dive Martin Graff, with the help of the divers, was busy identifying the sharks and adding new ones to the database. There are over 150 known sharks that frequent the area. The crew know many of them by name and are always excited to see old friends. We added four new sharks to the database. The database is full of individuals with names that vary from Bite Face to Bruce. It is amazing to see the passion and excitement exhibited by the crew even though they make this trip several times each fall and some have been doing it for over 10 years. The crew work tirelessly around the clock and it is obvious they are driven by a respect and passion for these incredible animals. The water around Guadalupe is relatively warm ( 76 F – 25 C ). Almost all open water, regardless of whether it is considered warm would lower your body temperature eventually without proper protection. We donned 7mm wetsuits so that we could stay under for extended periods. I eventually removed the hood, and a couple of people tried diving without wetsuits; but only one person, a neurosurgeon from South Dakota, managed to spend any extended time in the water without the protection of the wetsuit. I was in the water more than 15 hours over the 2 1/2 days spent diving. I gladly accepted any additional time slots available in the cages. ( yes, believe it or not some people took breaks and gave up their designated time slot in the water). We were anchored in 300 feet of water. 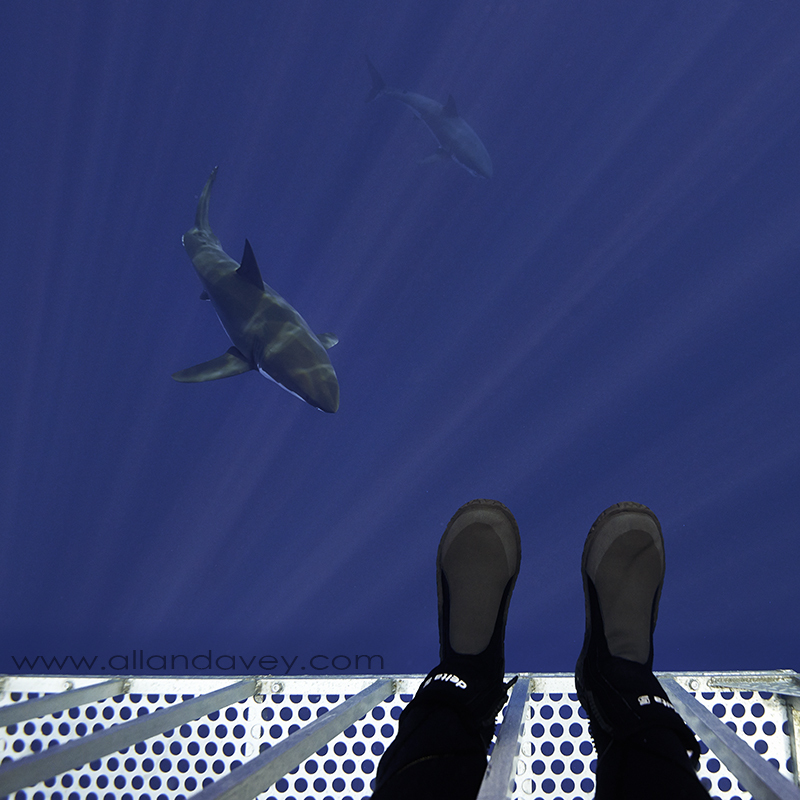 When we looked down into the abyss we could often see white sharks circling silently below us. It was amazing how they could appear and disappear in an instant. We would follow a shark swimming under the cage and it would not exit when we looked for it on the other side. It was just gone. 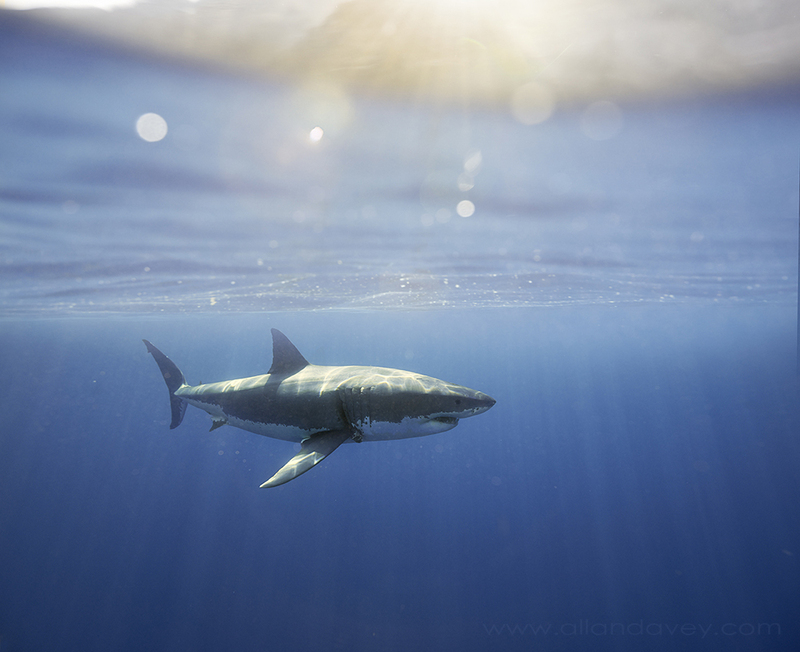 It wasn’t long after slipping into the water that first morning that the first white shark arrived on the scene to check us out. The first thing that struck me was how calming the whole experience was. I wasn’t expecting that at all. Turns out that it is surprisingly peaceful watching these sharks gracefully and silently circle the cage. If you can imagine being suspended nearly weightless surrounded in all directions in surreal blue; the only sound is the sound of your own breathing. A constant flow of crystal clear sea creatures fly by in slow motion flickering blue and red phosphorescent lights. It is a meditation-inducing experience. Even as the white shark fades in and out of the blue, it moves in slow graceful motions that completely defy its innate unfathomable power. It is only when the occasional curious shark keeps coming out of the blue directly and consciously intent on exploring you, the unusual intruder holding a camera which looks like a giant eye, the giant gaping maw of razor-sharp teeth opening before you, mere inches away,… that is when the meditation turns to unbridled excitement. Pure magic. We used Hookah instead of Scuba; wearing tanks in the confined space of the cage would be cumbersome and unnecessary. Hookah uses a regulator similar to what you would use with scuba, but instead of it being connected to tanks on your back it is connected by a hose to a continuous air source in the boat. It isn’t necessary to be a certified diver to do this type of diving, although only a few people on the trip weren’t certified. I felt I wanted my son Sam to be completely comfortable breathing underwater so that he could really concentrate on the experience of sharks, so we did an SDI certification prior to the trip. Generally four people at a time would be in the cage. Two cages at a time were in the water. We were over weighted compared to scuba so that it was easier to maneuver around the cage. I was able to climb up and around the cage easily, but we had to be careful when moving around that we weren’t sticking a leg or an arm out too far or for too long without paying attention. These sharks could appear out of nowhere at any time in complete silence. With the larger camera I couldn’t put my camera out between the bars just anywhere. I spent most of my time hanging out of the larger “window”. I had to repeatedly look over my shoulder when I was focused on one shark, and was surprised to see another disturbingly close on a couple of occasions. When I was shooting the half & half shots I had to move the camera to the surface outside the cage. The distance from the surface to the window was a bit unnerving. I couldn’t just pull the camera in through the bars. I had to lower it down to the window to bring it into the safety of the cage, which was something I couldn’t do in an instant. The camera was almost neutrally bouyant so if there was an emergency I could let go and pull my arms into the cage. The camera would have very slowly dropped and I would have been able to grab it if needed when it went by the window; but fortunately I didn’t need to do this. I was being very cautious. You have to be extremely aware at all times of the entire surroundings. Not always easy when you are trying to frame a photo, change settings, and follow the action, but absolutely crucial that you don’t take any chances. It is obvious who would come out on top if you make a stupid choice. We also had our cage-mates to alert each other of additional sharks on the move. The sharks were very curious and would come right up to the cage and check out each person. You could see them making eye contact with each person as they swam along. It was amazing to connect with them like this. They were especially interested in my glass dome which resembled a large eye. 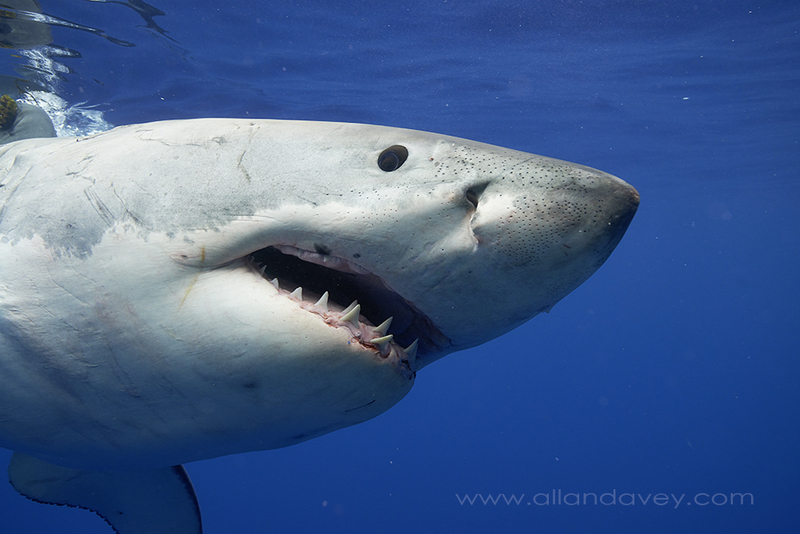 For the record white sharks have blue eyes. The crew members do not feed the sharks; they don’t want them associating humans with a food source. To attract their attention they put fish heads in a natural burlap bag that is attached to a rope. The crew on the surface throws it out into the water and pulls it out of reach when the sharks show interest in it. Every time a shark arrived someone would yell “White Shark!” When we were topside It seemed like they were constantly yelling it out. Two of the sharks had mastered the art of deception and on a few occasions outsmarted the crew by snatching the bag before they could pull it out of the way. These two sharks realized they could use the shadow of the boat and cage and rocket up from the depths before anyone could see them coming. On a couple of occasions a seal came over to check us out. There was also plenty of Mackerel and Tuna swimming around us, which the seal hunted with incredible speed and agility. The white sharks showed interest in the seal, but the seal swam circles around them and seemed to be taunting the sharks, and could easily out-manoeuver them. The bulk of the sharks that frequented our cages were simply curious, coming up to the cage and looking each person in the eye and go from one person to the next. 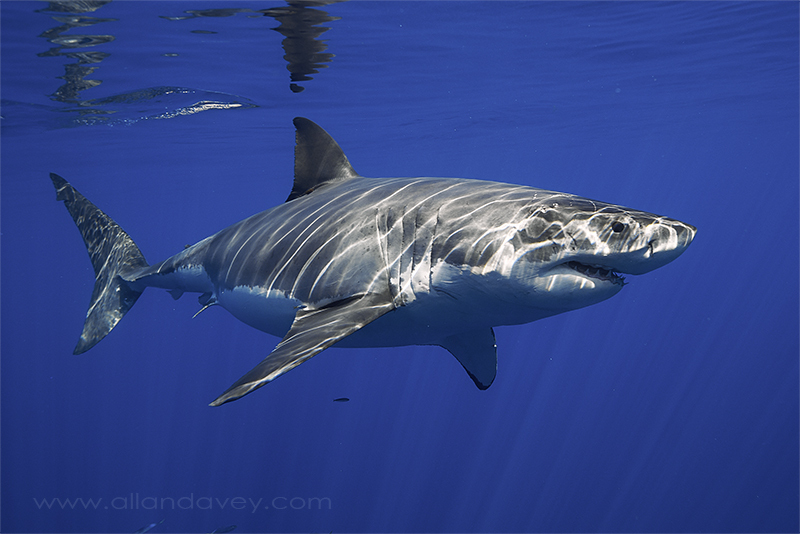 (Incidentally white sharks have blue eyes). Over 20 individual sharks frequented our cage over the course of the trip, four of which were new to the database. They ranged from a young shark that was pristine, slick and wary of our presence, to 16-foot males that were bent on showing us who was in charge of the territory. At times as many as 6-7 sharks were at the cage at once. They are territorial so it was fascinating to watch when two large sharks showed up at the same time. They would circle each other, then swim along beside one another and eye each other up, discerning which was the larger shark. The larger shark would have right of way. Very similar to behaviour you would see in a dog park. The older individuals had some serious scars from altercations such as these. It was surprising to see just how beat up the big sharks were. Apparently even at the top of the food chain things aren’t entirely safe. Mating season can be particularly brutal. On that note the much larger females don’t show up until later in the season, at the end of October and into November. No one really knows much about the white shark mating rituals, and where or if it happens in specific places. Two of the sharks that frequented our cage had tracking transmitters. 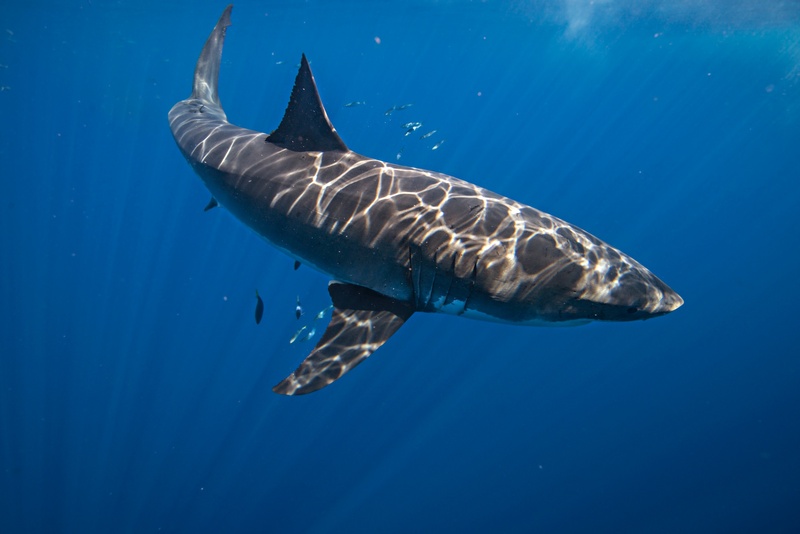 Some tagged sharks can be tracked in real time using a phone app, and it is surprising just how varied the environments are that they explore are. These incredible animals cover a lot of ground. 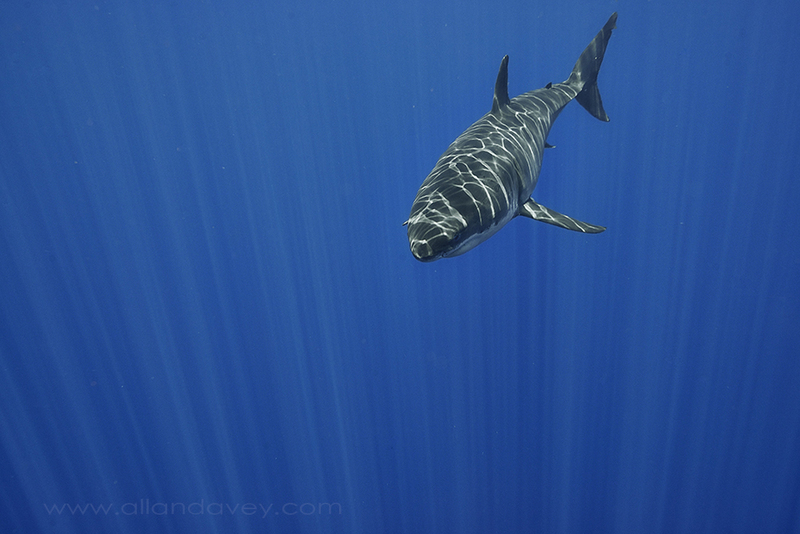 White sharks are loners, so when they gather at feeding grounds like Guadalupe they have to sort out who is boss. They circle each other, then swim along beside each other to size up who is the bigger shark. It is not uncommon to see fresh wounds from these altercations. Some of the older sharks looked really beaten up. Apparently the ocean isn’t a safe place even for these top predators. Some of the older sharks showed signs of considerable wear and tear. Mating season can be extremely difficult for them. We had sharks visit on every session in the cage which apparently isn’t always the case. There was a lot more action on our trip than on previous trips. (This has continued on trips after ours). Two of the larger sharks exhibited unusual behaviour which prompted discussions amongst the crew. They were repeatedly gnawing on the cage, and one would get under it and knock it from below. They weren’t trying to attack but they were being aggressive. At one point while one of the sharks was biting the cage, a tooth dislodged and started to flutter down. My cage mate went to grab it but realized what he was doing as he started to reach towards the gaping jaws, then quickly and fortunately realized that would be unwise. Made for some great personal experiences but also made me ponder what is happening to these sharks and their environment that might explain this behaviour. Then again our Dive Master Martin Graff said that as soon as you think you know something about white sharks they do something unexpected, and everything you thought you knew goes out the window. Even though the white sharks come to Guadalupe to feed on seals, this seal didn’t seem at all concerned. It could swim circles around the sharks and seemed to be taunting them. The sharks showed interest but none put in the effort it would take to make a meal of this brave (idiotic?) seal. They prefer the young, injured and unsuspecting seals for their snacks. 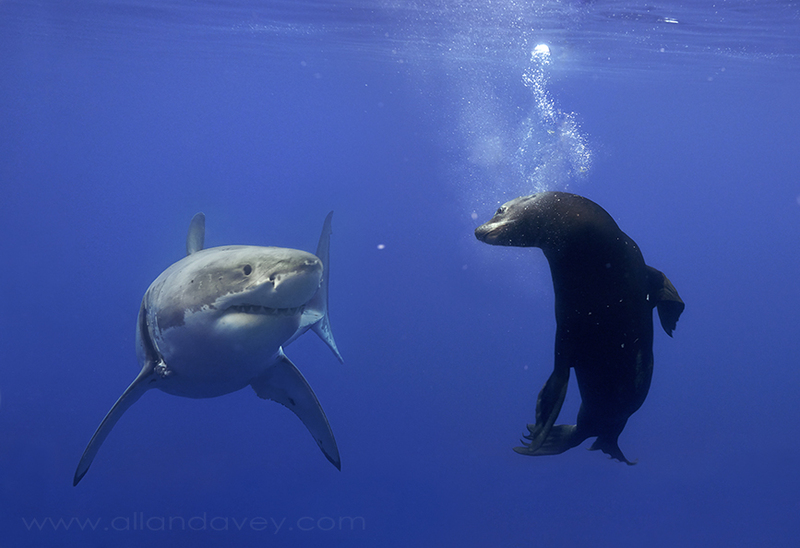 This young white shark seemed no match for the agile seal. Either that or the Shark was not in the mood to make any significant effort. On reflection the only thing I found disappointing about this trip was that it came to an end. I could have stayed underwater for days. It was an experience of a lifetime that I would do again in a heartbeat. I have been fortunate to have had the opportunity to explore the waters in the Red Sea, Indian Ocean, Great Barrier Reef and the Caribbean, but this trip will always stand out in a way that can’t compare. I hope it is not my last shark encounter…I guess you could say I have been bitten by the shark experience. Experiencing these magnificent animals in their natural habitat is a life-altering experience. You can’t help but leave with a new appreciation and respect for them. Sam and I will treasure this experience for the rest of our lives. Looks like you had a fantastic trip. Defo on the bucket list now!!!!! This is incredible, Allan. Thanks so much for sharing! I appreciate you taking the time to check it out. awesome images and great blog! I went on the same trip earlier in September and 1) I completely agree that there is only one company & location to book with! 2) I am COMPLETELY jealous of your amazing photos, nice work! Thanks ! I hope to go again. Great photos Allan. Must have been an amazing adventure. Lucky Sam ! Awesome photos I can’t wait for my trip this year. Can you recommend a waterproof point and shoot camera for amatures? Also there is a scuba adventure in Norway with orcas have you thought about doing that? Thanks, I think the Olympus Tough is a great little camera, and it fits between the bars. That and a gopro would satisfy most peoples needs. They are available for rent from sharkdivers if that is who you are going with. Have fun! Thank you for the info I was looking at the Nikon coolpix and canon powershot, but I will check out the Tough. I already have a GoPro hero black 3, so I’m good to go on that end. Also the link to the orcas is here http://bigfishexpeditions.com/OrcaDivingNorway.html. I’m thinking of going to the Fiji trip myself in 2016 it seems like a great time! I reference your blog everytime I want to get excited about my trip thanks again for the great pictures, they keep me going! Thanks for the heads up on the Norway trip. I think my next trip will be with shardivers to fiji for bullsharks.